Women are out in the lakes and they're out there on the waves padding just as hard as the guys! The Pipes is KIALOAa's new women's SUP paddle. It is light, fast and has a slightly smaller blade with a narrower profile than most paddles, to better match the typical female paddler. 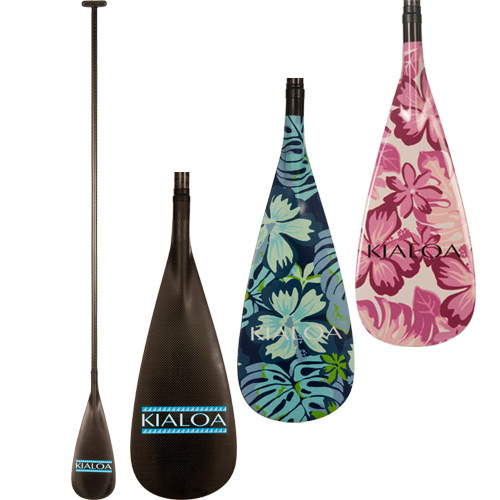 Since 1991, KIALOA has been making beautiful, cutting edge, hand-made SUP paddles from the United States. Kialoa's full carbon fiber SUP paddles are still the very best when one is looking for a paddle of the highest quality . Designed and engineered with the best ratio between toughness and weight, each paddle utilizes a carbon PowerARC blade design with a 10-degree bend, an ovalized tapered carbon shaft and a carbon Ergo-T. With each drag through the water the paddle feels clean, sharp, and saves energy because of it's stiff, strong body and narrow, light design.